Multilevel Marketing Business is growing day to day, in that Australian Binary MLM Plan is more profitable and simple business plan to understand. Good MLM software is Australian Binary Plan and this is because more organization, peoples are looking for the Australian plan for the business. 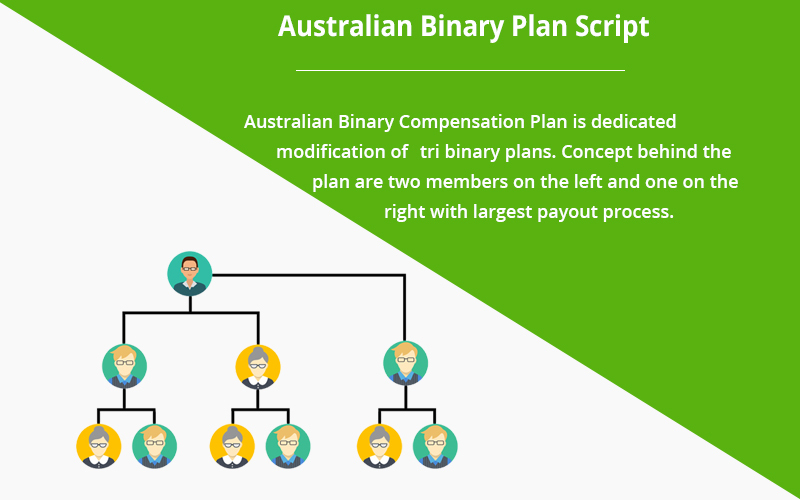 This plan is fully based on Tri binary Plan and the layout of the Australian MLM plans is two of the member in the right and one member in the left, so it is called as 2:1 or 1:2 binary plans. In this plan, the member is independent to recruit two direct members from left and right, apart from there is a provision to add one more parallel member and which don’t want any matching pairs for the commission. In this plan, the whole member of the organization or client will work each other for the development of the organization. This plan will helpful for the clients and organization for the successful business. Compare to other multilevel marketing plans Australian plan has quick commission generation. They are mainly two types of bonus are available in the Australian Binary Compensation Plan they are sponsor bonus and table split bonus. This plan provides a high Return on Investment (ROI) to the clients and organization. Our MLM software is responsive design, safe and secure, reporting features, and reliable. The main features of the Australian Binary MLM Software are attractive user interface, developed in cutting-edge technologies, user-friendly, simple & reliable, easy registration and login process, advanced security features, integrations with online payment systems, commission models, powerful admin dashboard, SMS integration, e-pin generator, secure source code, and more on. The customization of the Australian Plan is possible according to the client needs and business goals. We have experience MLM developers and technical expertise to grow your MLM business successfully and we ensure that you to get the best Australian MLM binary plan with minimum cost and standard quality. We served both domestic and international MLM clients with many of our experience in this MLM industry. Customer satisfaction is the main objective of our business. Phpscriptsmall is one of the best MLM software service providers Chennai, India having more than twenty plus MLM software and also providing demo services to the network marketing members or organization. We are the right place to deliver the best Australian Binary Plan Script to the clients.